While most of us wish we were sitting on a sunny beach for Family Day, there are some great ways to make the most of our cold climate. 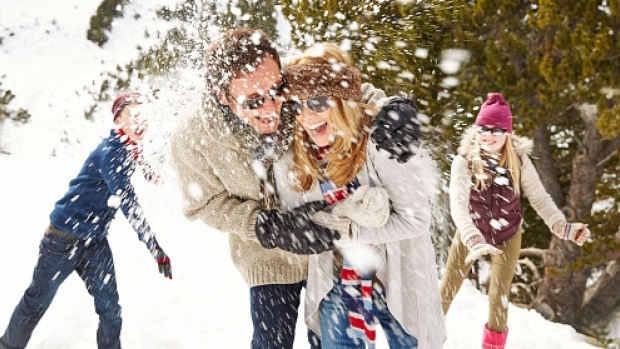 Here are 10 must-do winter family fun activities that you can do! After a fresh snowfall, you’ll want to make your mark in the white fluffy snow whether it be by cross-country skiing, downhill skiing, tubing, or snowboarding, For more information on trails, hills and snow conditions, visit www.skiontario.on.ca. Go for a winter hike or go snowshoeing. Tote your camera, kids, and binoculars and admire the beautiful winter transformations. Winter is a great time to get outside to take in some of the art and beauty of nature. There are plenty of indoor and outdoor facilities for skating in the winter. Simply decide whether you want the full winter experience (skating outside on a lac, river or outdoor rink…), or if you want to stay warm inside an arena. Many large cities will have iconic skating areas that you can try; the Natrel Rink at Harbourfront in Toronto; Cedarena in Markham; Rideau Canal in Ottawa. Dog Sledding is becoming a more popular way to celebrate the great Canadian winter! Here are a few places to go dog sledding in Ontario: Ride The Wilderness, Winter Dance, and Wilderness Adventure. If you’re interested in seeing a local dog sled race, head out to the Kortright Centre in February for their annual dog sled races. Visit: www.kortright.org. Dress your snowman in one of your old Halloween costumes or used clothing. Use drops of food colouring to make colourful streaks through the snowman. Have contests to see who can make their snowman look most like your favourite character, a friend, you, or Mom or Dad! Sliding downhill is an exhilarating activity! You can use sleds, crazy carpets, or toboggans. Scout out a good, safe hill to conquer with that toboggan you’ve been storing in the garage! Children five to nine year of age are most susceptible to injury. Parents of young children should not let them sled alone and older children should be taught to check for hazards. Make a snow sculpture for some creative outdoor fun. Plow your driveway or yard to pile the snow high. Begin to sculpt with your hands, spoon, shovel, or other tools. Use your imagination to carve a form such as an animal, a snowman, Santa, or anything with a Winter theme. You can add colour to your snow sculpture by dissolving food colouring in water and painting it on the sculpture or mixing it with the snow. Have a fun and don’t forget to take a picture when you’re done! And for those winter enthusiasts really looking to get away, here’s your chance to pack in all your favourite winter activities all into one place! Check out Winterlude – North America’s greatest winter festival in Ottawa/Hull. Winterlude offers fun-filled weekends of excitement and activity for the whole family! For more information: visit: www.canadascapital.gc.ca. Winterlude takes place from February 1 to 18, 2013. Hot chocolate can really sooth and warm kids after outdoor activities. You can make it ahead and bring along a thermos to keep warm. Add some fun toppings to dress up your hot chocolate: a dash of cinnamon, a few spoonfuls of whipping cream with a dash of cocoa powder, chocolate sprinkles (or other fun colourful sprinkles), chocolate sauce, chocolate chips, or the classic: miniature marshmallows. So why stay cooped up this Family Day when there is so much to do to enjoy our great Canadian outdoors! Get out, bundle up, and have fun! Decorating a Christmas tree – For Newbies.